Made with love & happiness. Gluten free.If you are looking for real Texas-style smoked meat flavor without firing up a smoker, you've come to the right bottle. 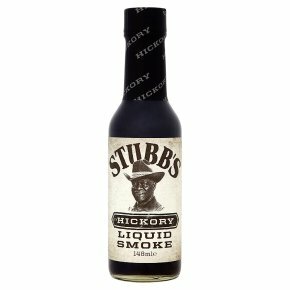 Stubb's Hickory Liquid Smoke will give you Bar-B-Q the sweet, smoked flavor of real hickory. For authentic flavour, mix 1 to 2 ounces of liquid smoke into your marinade or add 1 to 2 drops directly to the meat as you cook. Keep in mind a little bit goes a long way.